These settings help search engines pull up results for your site. Social media platforms will also pull from these settings to build your site preview to share. These settings exist on each page you have in your site and will need to be filled out for each page. SEO Description – This is the description of the page and is typically included as the paragraph under a search result that describes the content of the page. This isn’t necessarily used to index the content but is important for how results are previewed and encourages someone to click on the link. Keywords – Most search engines, including Google, completely ignore keywords for search ranking because they are too easy to game. Lots of people choose to leave these completely blank, however, some people like to include keywords for certain systems that are indexing these for use internally for their own search purposes. In short, don’t waste too much time on these if you are just looking to increase your search rankings. 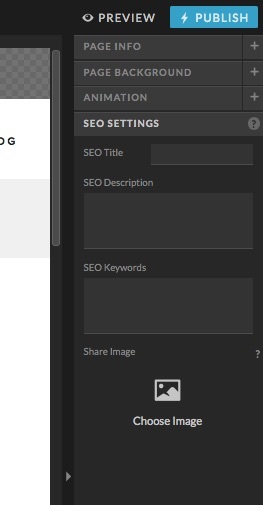 Social platforms will pull the SEO title and description from your site as well as the share image set there in order to build your share preview. If your preview isn't showing correctly on Facebook specifically, you may need to use their debugger tool in order to get that preview showing correctly on the Facebook platform.